* Pulled from the archive – check out all these reviews! The peanut butter storm has arrived. Listed alphabetically to avoid preferential treatment, enjoy the biggest peanut butter review, ever? What’s your favorite brand/flavor? Powdered peanut butter? It makes sense, when peanut oil is produced there are lots of leftover crushed peanuts and Bell Plantation was smart enough to package and sell them. The texture is of a very fine flour that can be reconstituted with water for an 85% less fat peanut butter. Because it is lower in fat, it’s higher in carbs and protein but still manages to have about 1/4 of the calories. In my mind it’s a little pointless to reduce the fat because the fat is part of what makes peanut butter so healthy, but many bloggers have been raving about this stuff so I had to give it a try. So far it’s pretty good, I find it useful in things where regular peanut butter is more difficult to incorporate like protein shakes or baked goods. While it will never replace peanut butter, it’s great for adding peanut butter flavor to everything! Order online at Netrition, regular or chocolate flavor. This jar is reminiscent of P.B. Loco Dreamy Creamy and America’s Choice Creamy. All of them are no-stir peanut butters with a touch of sugar. The consistency is perfect, especially once whipped with a knife. I picked this jar up recently but have never seen the brand anywhere before or since. Melts very well on toast. I’ve tried several brands of almond butter but never liked them. And due to it’s higher price, I was never inclined to try others. After tasting a sample of this flavor, however, I immediately ordered more. The flavor is a perfect combination of vanilla and almonds like I never thought possible. The texture is wonderfully creamy as well, but not sticky like the other brands I’ve tried. This nut butter is best served on top of Blueberry Pancakes, the combination of flavors is wonderful. The consistency is very similar to the regular butter toffee but the chocolate flavor takes over in this one. The sweetness is kept at just the right level and the gritty texture, a combination between creamy and crunchy, is maintained making this a delicious peanut butter straight from the jar. I’ve had honey roasted peanut butter and cinnamon raisin peanut butter before but never honey cinnamon. The sugars are very low on this flavor but you would never know it. There is a strong cinnamon flavor with a hint of honey and roasted nuts. While it won’t replace my homemade cinnamon raisin, it will have a place next to it on my shelf. This variety isn’t yet available but I was sent a small jar to sample. Just like all their varieties, Naturally Nutty has incorporated flax and hemp seed and produced a very creamy nut butter. The flavor reminds me of the chocolate covered sunflower seeds even though there is no chocolate, but apparently there is a chocolate flavor in the works that will be available soon as well. I will be picking some of it up for sure. If you’ve never had sunflower butter before, be sure to give this a try when it’s released, it has definitely exceeded my expectations. P.B. Loco ($5.95 – $6.95) – I still have a few small jars remaining, for a review of their whole product line click here. Cinnamon raisin is a popular flavor combination that works very well with peanut butter. This brand in particular is quite sweet, a little too much for my tastes. Like all their flavors, this is a no-stir peanut butter due to the addition of palm oil, which makes it much easier for daily use. While delicious, I prefer homemade because I like less sugar and a bit more cinnamon flavor. Best way to use this flavor is with sliced peaches on a toasted Linda Delite sandwich. This crunchy peanut butter has a nice creamy texture between lots of large chunks. The chunks themselves aren’t quite as firm as some other brands but they have a very fresh roasted taste to them. Since their other flavors are so sweet I like that they don’t add sugar to this one, making the only ingredients peanuts and salt. As far as crunchy goes, this one is high up on my list. I’m a dark chocolate snob. I have some every morning with coffee from a stash almost as large as my peanut butter one. This flavor is delicious, and while there is a lot of sugar, the chocolate and peanut butter flavors are balanced nicely so as not to be too sweet. It’s blended to a perfect creamy consistency that is best enjoyed on a banana or by itself. You can easily make this flavor to control the level of sweetness and strength of chocolate, click here for the recipe. A recent addition to their lineup, this is probably my favorite flavor of theirs. The maple flavor is strong yet the consistency remains creamy. Perfect on pancakes or waffles and delicious on toast or a sandwich. The recipe I use to make this flavor yields a much thicker spread, click here for the recipe. A simple and delicious creamy peanut butter, containing only peanuts and salt. Texture is almost identical to “Crunch Time” except for the chunks but the peanut flavor is a little less intense because of their absence. Since there is no palm oil, there is quite a bit of oil separation which is easily rectified by mixing and storing in the refrigerator. The best way to describe the consistency is somewhere between Trader Joe’s and Naturally Nutty in terms of creaminess. Could use a pinch more salt in my opinion. Here is a recently released honey peanut butter similar to “Mighty Maple” except that honey is used instead of maple syrup. In both of the flavors, sugar comes before honey or maple syrup. This is probably for two reasons, the first being cost but also because honey and maple syrup bind strongly to peanut butter and make for a very thick consistency. While sweet, this flavor lacks a strong honey flavor. Whole Foods often has machines for grinding peanuts into fresh peanut butter and they usually have one filled with honey roasted peanuts. If you can find it, I recommend getting that for one of the best peanut butters you will ever have. Otherwise you can easily make this flavor yourself, click here for the recipe. This is the most interesting flavor in my mind. Creamy, well-blended and spicy, its uses are very different and unique. Chili powder is the most apparent flavor but the cayenne and paprika come through as well. This peanut butter is great for use in peanut dipping sauce or in stir-fry. It’s also great on a turkey or chicken sandwich along with something to compliment it like apricot jam or a touch of sour cream to cool it off. It may be difficult to use a full jar, so I recommend mixing up a small batch of your own: 1 cup peanut butter, 1t chili powder, 1t crushed red pepper and 1t cayenne pepper. The texture is very similar to the dark chocolate flavor, creamy and rich. I used to love white chocolate but find it too sweet nowadays. While sweet, it was not sickeningly sweet like I expected. The sweetness hits you right away but immediately turns into a strong white chocolate flavor that lingers on your tongue. Overall, this is a well-balanced peanut butter, perfect for any white chocolate lovers. You can also make it yourself, click here for the recipe. A great jar from the New England area, this all natural peanut butter contains only peanuts and salt but for some reason the oil does not separate as with most natural peanut butter. The taste is fresh, it’s perfectly salted and the texture is soft and creamy (like a teddy bear) but thick and sticks to anything, I highly recommend it. This is a staple in my pantry and I usually have anywhere from 3-8 jars on hand. It is ultra creamy, I doubt you will find one creamier. Even if you refrigerate it, it is still the consistency of room-temperature Skippy. It’s very easy to use in baking because it is already like a liquid and flows much easier than honey. My favorite use for this is to make homemade cinnamon raisin peanut butter, my favorite flavor of all time. While I love the non-organic creamy variety (above) I’m not a huge fan of their non-organic crunchy. I’ve heard that organic ingredients are not only higher in nutrition but also have more flavor and this organic variety does not disappoint. Great texture, perfectly salted and while it’s all natural, the oil does not seem to separate much which makes it much easier to stir. Overall, it’s not quite as tasty as Whole Foods 365 Crunchy PB (only $1.69, click here for review) but makes for an excellent substitute when a Whole Foods is out of reach. For all other peanut butter and product reviews, click on reviews on the sidebar or in the recipe index. Hope you enjoyed this mega peanut butter review! I love Vanilla Almond Butter too! It’s my favorite nut butter I’ve tried so far. I’ve tried a lot of pb’s. Hands down best is whole foods organic crunchy or creamy. Best ratio of pb to sugar in there. A close 2nd is pb company, any flavor. Oh my gosh, what an awesome collection! Enjoy all your different flavors. I’m jealous, but I’ll be fine sticking with ole faithful, natural smooth pb. I am green with envy over your amazing PB stash. YUM! Question though, peanut butter boy, do you know the gluten status of any of these flavored peanut butters? As you probably know, “natural flavors” is one of those suspicious terms that gluten often hides in and I’d guess that such a phrase is branded on several of your jars. Oh…I sure do wish I didn’t have a peanut allergy. I would definitely love the butter toffee PB. What a great collection! PB&Co. is amazing – Dark Chocolate Dreams is my favorite. I really want to try making my own version sometime! That is a whole lotta peanut butter! What a great collection! I would love some of those white choc wonderful! Just amazing! Great pictures. I think you should make a poster out of this collection and hang it near the kitchen. Great color and delicious at the same time! ooh, but what about that winning recipe?? What a great resource you have here. Now I have something to turn to whenever I have questions about any type of nut butter, not that you wouldn’t have been of great help anyways. Thanks for the post! My favorite PB is called Naturally More PB, it has omega-3’s from added flax and just some added cane juice. It is SO good. Wow, you have quite the stash, and well, you should PB Boy. I thought I had a bunch and I only have 4-5-6 jars. Lucky! Have you ever tried Naturally More? Now I know where to go in case there is ever a peanut butter ellimination in my area! I am so utterly jealous. 7 months – are you kidding me? I say 5…6 at the most! I’ll have to look for the Naturally Nutty and/or find it online because I don’t think I’ve seen it in stores here (Kansas). Just had me some Barney Butter on homemade bread. SOOOO good! Great reviews! I adore PB2 but lately I’ve just been having Kraft All Natural creamy peanut butter. It’s good stuff. The only flavored peanut butter I’ve had is the chocolate PB2… Some of those cinnamon ones and that dark chocolate dreams one look really delicious. But I like your idea of making your own peanut butter flavors just by adding things to the jar! Good reviews. 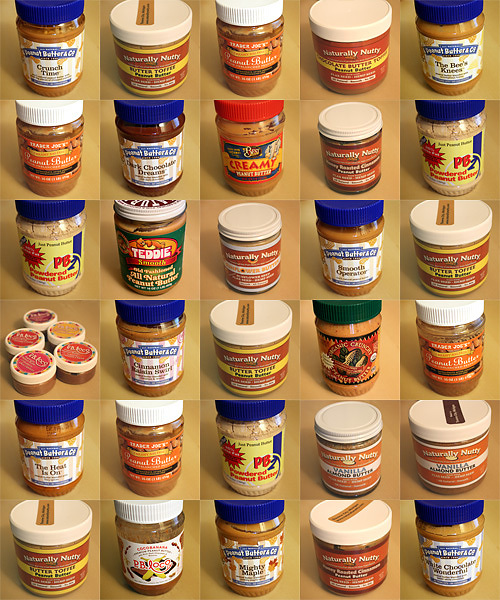 My current favorite is Naturally More …didn’t see it listed?… But my second fave is the TEDDIE peanut butter..OH so good! I’m glad you’re okay with PB2! I think it might make a great PB sauce too. You’re right about Naturally Nutty. I did try it and it’s so good. Also – the folks at Naturally Nutty are terrific to deal with. PS I love PB2 – I usually mix it with regular natura pb though, so as to reduce overall calories, while not compromising peanut butter flavor and texture. hey, if you’re the peanut butter boy, I’m the peanut butter girl. my school lunch EVERY DAY for 13 years was skippy creamy on white bread–no jelly! I was even called “peanut butter” by my mother on more than one occasion. I’m adding you now to my blogroll…will you do same? also, I do a weekly roundup which features a gluten free recipe and noticed some of yours are gluten free. maybe I’ll link to one on occasion if that’s ok with you? Congrats on your win and your yummirrific collection! btw, while I’ve tried the newer peanut butters like pb & co.’s white chocolate–and yes it is wonderful–I’d have to choose my old fave skippy. OMG! Now I don’t feel so bad about my shoe fetish :) Seriously, I’ll take that toffee PB off your hands any time. Seriously. I am DEF bookmarking this page!! amazing!!!!!! thanks for all the wonderful tips. you really outdid yourself, nick. i have pb&co smooth operator, too, and i like it but i knew something was off. thanks for bringing the small amount of salt to my attention. i have a question, would it be appropriate to just sprinkle some salt in the jar and keep it in the fridge? or should i sprinkle on salt in specified little amounts right before serving? … Or you could allways sen me some, lol ;)! this is quite a feat! I’m a big fan of peanut butter & honey. Hmm, did you ever try adding vanilla to almond butter? I’m curious if that would do it, although I think the difference with that flavor above is the addition of ground flax seed and just a touch of sugar. If you give it a try and it’s tasty, let me know! I added about a tsp of vanilla and a bit of honey, and it was great! I think if you use a bit of your preferred sweetener, the flax seed becomes moot. My new favorite almond butter is the Whole Foods 365 chunky style. Big surprise, as that is a favorite peanut butter as well! Wow… I had no idea there were so many kinds of peanut butter out there! My mom and I are also pretty crazy about it, but we tend to go for quantity over gourmet quality. That said, we’re pretty specific with what we want in our peanut butter: just peanuts. We get 2kg (4.4 pound!) jars of store brand natural creamy peanut butter that only has the one ingredient. Unfortunately, you have to stir it, and that’s a lot of peanut butter to stir! Also, the quality and texture varies quite a bit from jar to jar. But we sure go through it fast! I’ve bookmarked your site, you seem to have some great recipes on here! I bought the brownie mix and sherbert and will be trying out the raspberry brownies soon! Raspberry brownies can’t be beat! Did you ever make them? As for peanut butter, I’m not into the gourmet stuff either. My favorites tend to be the cheapest natural pb I can find. Right now, it’s Whole Foods 365 brand crunchy or creamy – they’re both fantastic. Not only are they the cheapest peanut butter you can buy ($1.79 a jar), but they are both my favorite. Due to the coarse ground nature of it, the oil doesn’t separate as much as with other brands. Also, a good trick – when you get a big jar, stir it up real good until its combined, then dump half into an empty jar (save at least one old pb jar!) and put it in the fridge. Then you only have to mix half a jar each time, and when you near the end just take the other one out of the fridge. If your jars are really big, divide it in 3 or 4 even! That’s a good idea with the stirring. I did make the raspberry brownies. Unfortunately, I overcooked the brownie and then froze it too hard and too fast, so that I had to saw it with a pizza cutter and a good bit of effort to even get a piece out. After that, I was put on a diet by my traditional Chinese medicine practitioner where I’m not allowed to have wheat, dairy, or frozen things (or peanuts either). So. It sat in the freezer until today, actually, when I decided that it was time to throw it out. :( Maybe I’ll try it again someday when I’m not on food restrictions. Best Yet peanut better is considered a store brand, and can be found, among other places, at Holiday Foods in northern California. I discovered it fairly recently, having become absolutely fed up with the tampering that Skippy’s has done to their brand. Yea, I’ve only ever seen it in northern Cali. Now that I’m back on the east coast, it’s no where to be found. But that’s ok with me, I was never a fan of Skippy and while Best Yet is good, I have never found better (or cheaper) than 365 Crunchy or Creamy. Try Naturally More peanut butter. I have only found it online and at Walmart. It is loaded with omega 3’s, extra protein, and extra fiber. Plus it tastes great. I think my nut butter collection may rival yours a bit though I have lots of other kinds besides pb. That’s an amazing stash though! I love Naturally Nutty and PB&Co especially! Oh really? You’ll have to prove it! I think I need to post an open challenge to rival my collection and see what other people can come up with! I’m a purest. If it has any ingredient other than pb and salt (necessary to me). It isn’t pb. I would also be suspicious of a “natural” pb that doesn’t separate; it usually means some form of hydrogenated fat has been added. On the other hand, pb’s that are to liquid tend to squish out of my pb & j’s and hence onto my pj’s. (I have them –the sandwich- in bed as a nightcap). I usually pour off the separated oil and use it to cook, and the pb is much more tractable. I hear ya. The best peanut butter has only peanuts and salt. But so called “natural no-stir” pb does not use hydrogenated fat but rather natural palm oil derived from the palm tree. It doesn’t do as good of a job as hydrogenated fats, but it’s pretty close. While natural peanut butter is my favorite too, I believe that every type of peanut butter has it’s use. If it’s too thin (like Trader Joe’s creamy), I agree that it’s terrible for a sandwich, but it’s great for recipes like soups or breads, since it mixes in well. And even natural no-stir (like Skippy Natural) I use for certain recipes like Peanut Sauce, when I want a little sweetness and to help thicken the sauce. Plus, natural peanut butter tends to be more coarse, which you don’t want in a recipe that requires smoothness. I need a recommendation for a DRY PB for a recipe. I used Creamy Jif, not realizing it was too creamy/oily & wouldn’t allow my PB bars to set up right, even in the freezer. It was originally made with Govt. PB years ago. Any suggestions? Interesting. For the most part, all peanut butter has the same oil content since they are all just crushed peanuts. But if it’s too thin, that’s another story. Are your PB bars chunky? By that I mean, could you use crunchy peanut butter? If you need it to be really coarse, I would suggest getting a natural peanut butter (where the oil separates to the top), but pour the oil off the top before you mix it. Something like Whole Foods 365 Natural Creamy or Chunky (if you don’t mind the chunks), or even Smucker’s Natural peanut butter, whatever you can find.